This post will give you night time photography tips so that you'll know how to succeed at taking photos at night and what camera settings to use. You'll get ideas on getting the exposure right when shooting at nighttime and a few tricks and techniques to use for creative night photos. Many new photographers make the mistake of avoiding night time photography because it seems like it is hard to do. It certainly is a type of photography we don't see a lot of, but it can be great fun to experiment with. It's actually simple to take great night photography shots if you remember just a few things. When it's dark, it's obvious that there's a lot less light to take your photograph. What it means to you is that your shutter speed will be quite a bit longer to get a properly exposed photograph. There are some situations where you may want to use your camera's built-in flash, but this article will cover the situations where you want to keep your pop-up flash turned off. Let's start with the best equipment to use for getting great night time photos. You need a decent camera. It doesn't have to be a pro model at all, just a camera capable for you to adjust its settings to give you the best shots. Cameras with bigger sensors will give you the best quality, but a decent camera will do you fine. A tripod is almost always a must-have piece of equipment, unless you want to lose all control over motion blur. 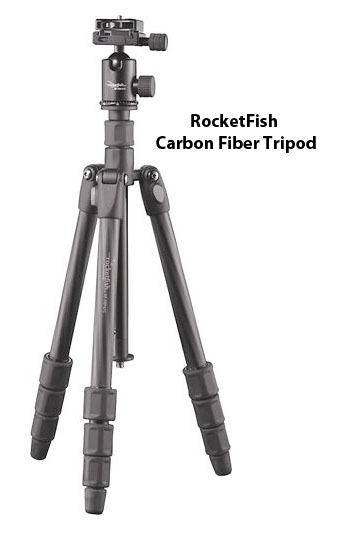 Using a tripod insures you'll get sharpness with the slow shutter speeds you'll be using. A shutter cord is extremely valuable if you need to open the shutter at a specific point in time. You can use your camera's self-timer function too. Either way you want to avoid camera jiggle. A flashlight is very useful. It can very dark where you set up and you will be setting your camera position and making adjustments to your settings while you're shooting. A zoom lens allows you to change perspective and composition, both important factors in how your photography turns out. Some photographers will insist on fast prime lens for photography of the stars, but that's a topic for another post. One of the biggest challenges is knowing how to get sharp pictures at night. That's usually because automatic focusing systems don't perform their best under such dim conditions. Here are 4 tricks to get sharply focused night time images. USE MANUAL FOCUS. Auto focus works great most of the time, but when it's dark your camera can really struggle to focus accurately. USE A FLASHLIGHT. If feasible, aim you flashlight at an object within your composition that you want to focus on. 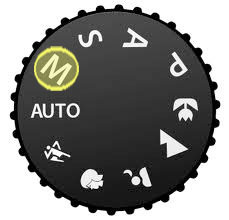 Use autofocus to focus on that object. Then switch your focus to manual and take the shot. LOOK FOR POINTS OF LIGHT. Use autofocus on a point of light that is within your composition. Switch to manual focus then recompose your photo and shoot it. USE LIVE VIEW MODE. You LCD will brighten the image. Try touch-screen focusing if you have it. Then you can also zoom in on your LCD screen and check for sharpness. Sometimes you can get lucky with auto exposure at night, but more often than not, your camera's meter will get fooled by the darkness and give you an overexposed image. You can start off by using one of the automatic settings and then use your exposure override function to adjust, but I've found that using manual exposure is more consistent. You have the luxury of trying a combination of shutter speed and aperture and looking at your LCD or better yet, your photo's histogram to judge the exposure. Each nighttime scenario is going to be very different, so there is no magical camera setting. Look at the shutter speeds and apertures used on some of the images on this page and use them as a starting point. As you can see from the camera settings that I've used for regular night time photography shutter speeds can vary from 0.3 second to up to 30 seconds. It depends on the subject matter you're photographing and how much motion blur you want to achieve-or none at all. Photographing the full moon directly, for instance, you'll want to use a shutter speed of about 1/100 second to prevent any motion blur and have it render sharply. Aperture settings can really be any f/stop you want, depending on how much depth of field you might need. The biggest mistake night shooters make is selecting a high ISO setting. It's easy to think you want to maximize your camera's light sensitivity since you're shooting in dark conditions. The truth is that your night time photography will have long exposures anyway and you'll be shooting on a tripod for stability. Lower ISO settings will give you much less digital noise , especially in the dark shadow areas of your photo, which night photos usually have a lot of. Set your ISO for somewhere between ISO 100 and ISO 800. 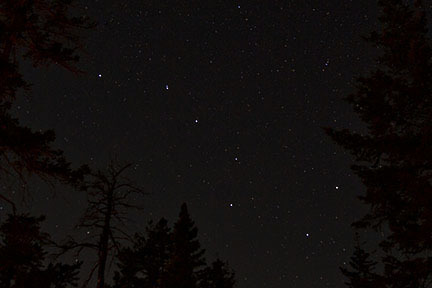 Photographing the stars presents you with a unique situation and your camera settings for shooting the stars are radically different from regular night time photos. Moonless skies are very dark. You need to shoot very long exposures at a high ISO setting and with your camera lens set at a wide open aperture. You can see the setting I used for this image of the Big Dipper when I camped on the schoodic Peninsula in Acadia National Park. 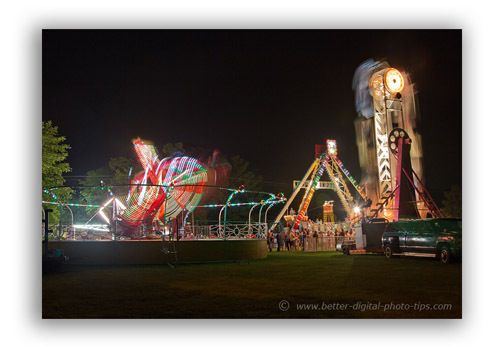 Just a couple of night time photography tips from a photo shoot I did at a local carnival. At the time, I had been wanting to see how my new Canon DLSR would perform doing some night time photography. I walked to a local Labor Day Weekend carnival to test my new camera and do a little relaxing, just-for-fun photography. The only photography gear I carried was the Canon 5d body, a 24-105 zoom lens, my Rocketfish carbon-fiber tripod and a remote shutter cord. I also had a brand new 16 gigabyte memory card, a freshly charged camera battery, and a small, pocket, LED flashlight. Many photographer do their night time photography by using a bulb exposure or bulb mode. I prefer using a set shutter speed so that I can get consistent results if I'm shooting a variation of the same subject. Just for kicks with the night shots of the carnival, I used my aperture priority mode and set my exposure compensation to underexpose between 2/3 to 1 + 1/3 stops. 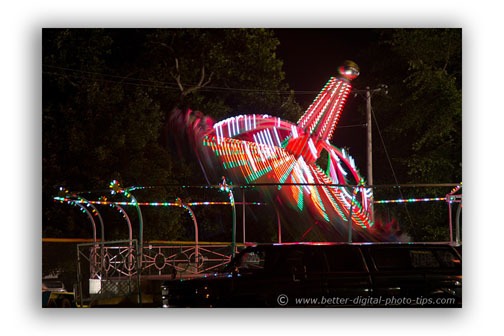 The camera's meter can get fooled by all of the very dark areas of the night and over-expose the lights from the amusement rides. I had to use my camera self-timer setting on all of the photos because the shutter cord I had picked stopped working. Ugh! 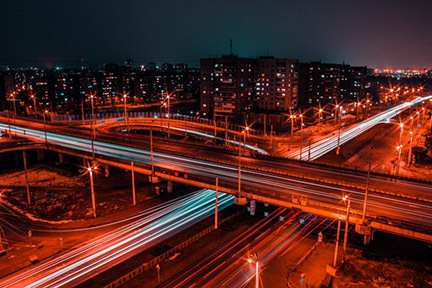 Pushing the shutter button with your finger can cause camera shake and image blur during the slow shutter speeds that come along with night photography. You can just look at your LCD screen and get a rough idea of how your camera handles the unique lighting conditions involved with night photography. Additionally, learning to understand a histogram can really help you judge the exposure better. I really like to use the histogram to judge the specific highlight and shadow values, sometimes even in the three different color curves for red, green and blue light, but hey, like I said-I am a camera geek. Using a histogram is not a must-do technique. It's just a way to understand exposure at a deeper level. Above all else I hope this article has inspired you to try some night time photography too. Shoot more photos. Shoot better photos. 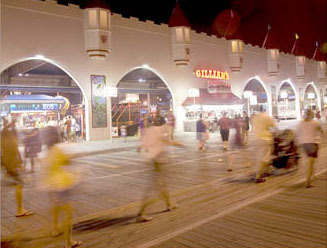 I took the night shot below on the boardwalk one summer evening in Ocean City NJ. I tried several different shutter speeds just for fun. Longer shutter speeds made the walkers disappear. Faster shutter speeds made them too clear. I thought the colors were really interesting in the photo below, particularly how the blue lights contrasted with the red. Part of the success of this photos also goes to finding a way to get to a great vantage point. Combining the visual interest of holiday sparklers with silhouettes of people is a winning combination for night time photography. 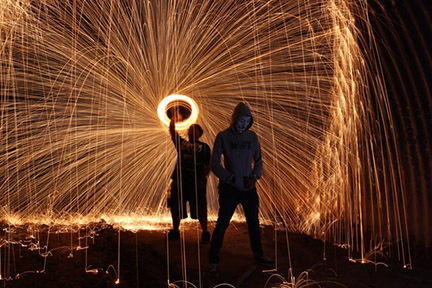 You can get really creative with this "painting with light" type of photography.